Many fans expected Doctor Who's current companion Clara Oswald to leave in the most recent Christmas special, Last Christmas, only for her to carry on adventuring with The Doctor into the next Season. 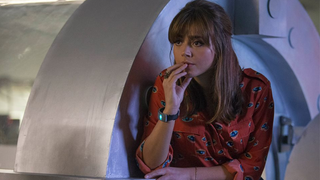 But a new interview with Steven Moffat confirms that Clara could have been gone even earlier than that. "I originally wrote her out in Death in Heaven," says Steven. "That was her last episode. And then she asked me if she could be in Christmas? So I said, 'Okay, I'll write you out in Christmas.' She came to the readthrough and did the 'write out' version - and again changed her mind. But the truth is I never wanted her to go. I didn't really want Death in Heaven to be her last episode. And with Last Christmas, I'd already written the alternative version where she stayed, and I preferred that version. For Christmas Day it's a bit nicer. Frankly, I didn't want to lose her. She's an amazing actress, and she never stops working to make Clara better. I was very happy to go the extra mile to make sure we could keep her." The decision for Coleman to stay makes her currently the longest-running companion in the revived era of the show — but considering all the back and forth on her decision to stay at the end of Season 8, it certainly seems like Season 9 will be her last.